Zion definitely has a lot of things that are cheaper than 99. However, one thing I absolutely hate about Zion is that most of their signs are in Korean. If you go to 99 Ranch or Mitsuwa, they would have English translation on the signs. This makes a non-korean like myself extremely uncomfortable when going there. Also, it's quite dangerous for them as they can be sued easily for not putting up English signs! You should definitely get bakery from Paris Baguette. I'm not sure what the hours work there, but sometimes if you are lucky, they will have fresh baked red bean dough nut balls and other Korean bakery. 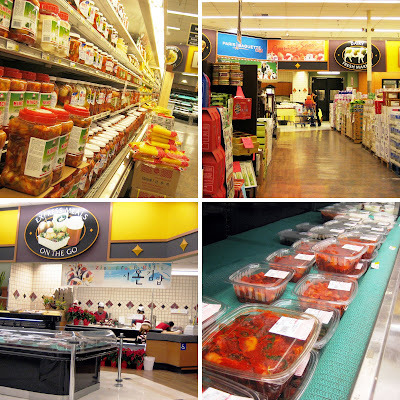 Hey Elmo - Zion is the largest Korean Market here in San Diego. It's interesting to see them expand to OC...usually it's the other way around. Hmm... I hope this doesn't spell trouble for Han's Market in Heritage Plaza. Thus far, the little mom & pop has been the only game in town for Korean groceries. awesome. gonna have to see if they have those spicy pickled cucumbers that i get at kaju soft tofu house. those are the best with a bowl of hot steamed white rice. First, why is it called Zion? How is that a Korean name? Also, I almost couldn't believe the cart selling food in front: Peanut-Butter Squid?!?!? I know what you mean about the English signage. Very frustrating indeed. A pack of udon I got also doesn't have English directions. That's not Zion's fault, but still, it'll be interesting when I get around to cooking it. Let's see how dumb I really am at boiling noodles! HAHA! So is Paris Baguette going to sell Vietnamese banh mis? That was my first guess, but then I thought: this is a Korean store. Ah, but other good things have come upward from you guys...like INSERT-NAME-ertos joints and their carne asada burritos! I was thinking the same thing. I hope Han's does okay. This is the equivalent of a WalMart coming to town. They do! I saw it with my own eyes! Well, you got me. Maybe the store owner's are real big fans of the Matrix movies? I doubt they are Hebrew. If anyone knows please enlighten us. So, I am guessing you didn't try the peanut butter squid? I would attribute the Zion moniker to the rising trend of Christianity in South Korea today - after the Philippines, it has the second highest percentage of Christians in Asia. That's a good explanation. Especially telling since if you Google "Zion" with "Korean", you get a lot of hits for Korean Christian churches. I think you were thinking of Mr. Baguette? I'm not sure if this is the same as the Paris Baguette franchise located in the States. Elmo what are you doing eating at supermarkets when you should be grilling up Kobe beef and skirt steak at Tsuruhashi?! Ha, I'm only joking though. Thanks for the post on Zion I'll probably check it out during Winter quarter: there's nothing better than a brand new Asian supermarket because it's actually clean. Elmo, even with the foods you don't like so much you still take the time to give them such wonderful descriptions. That's one of the reasons I like reading you. The mung bean pancakes are always done bland - you usually amp it up w/ some soy sauce. Heck, if i got the soy seasoned egged, I'd used THAT soy to dip it. And of course, I never had any better than my mom's. 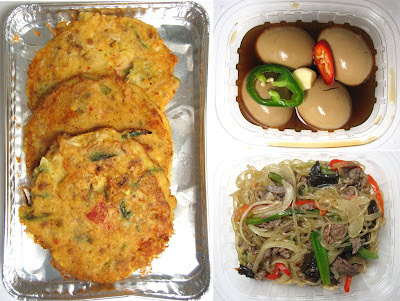 The clear vemicelli noodles are called Japchae. ( http://en.wikipedia.org/wiki/Japchae ) i never eat those cold. Always have them piping hot, esp the market bought ones. Yes, they are definitely different brands. I'll have to check out Paris Baguette and ask them if they do banh mi...because even Koreans should love it! HAHA! That's a good point. Better get there quick. Zion's spotless right now! I'm sure there's still some room available at Time Warner Center! That did sound weird. But it's still nice of you to say anyway! Dude, it's like you just showed me a secret level in a video game I've been playing for years. I didn't know until now that japchae is supposed to be eaten hot. As banchan in Korean restaurants, it's always cold. And you're right, I could've use the soy sauce from the egg (which was awesome, by the way) as dipping for the mung bean pancake. I did crisp them up in my toaster oven though (along with a sprinkle of salt), before I ate them. They were yummy after that. Tony Bourdain has on his show...except this time it's "steer" not "deer". been hitting this place up weekly now. the seasoned cucumbers are alright. not as crunchy and fresh as the ones at kaju. i highly recommend the spicy squid and the seasoned fish cakes. great sides to go with a bowl of steamed rice. I bet! Still afraid of the raw squid banchan though. It *is* raw, isn't it? I live right next to it, so it's now a convenient place to pick up some last-minute side dishes for dinner. One thing I must comment about it is that it way too Korean-ized. Being Chinese, I stepped into a whirring confusion of ahjumma's calling out in Korean. Organization is another element Zion should work on. I was looking for a jar of peanut butter for 10 or so minutes - and found out that they only sold Skippy WITH peanut chunks. Quite inconvenient since I was looking for the creamy kind, so yeah, variety's another thing. With a high gas price nowday, save yourself a trip to the market and order online. I found this Asian Spice Store online www.lamandy.com. Check it out.